Get out of town with these interesting Sydney side-trips: Katoomba (Wentworth Falls, Echo Point Lookout, & more), Norman Lindsay Gallery & Museum (in Faulconbridge) and Leura (Gordon Falls Lookout & Everglades Historic House and Gardens). Spend the 23rd (Wed) exploring nature at Sydney Harbour National Park. Spend the 29th (Tue) exploring nature at Kanangra-Boyd National Park. 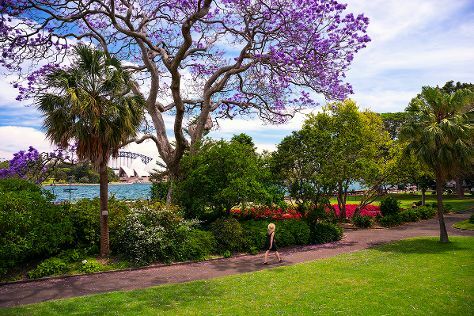 There's still lots to do: take in nature's colorful creations at Royal Botanic Garden Sydney, examine the collection at Australian National Maritime Museum, tour the pleasant surroundings at Bondi Beach, and take in the views from Sydney Harbour Bridge. To see traveler tips, reviews, other places to visit, and other tourist information, read Sydney online holiday builder . If you are flying in from United Kingdom, the closest major airport is Sydney Kingsford Smith International Airport. In October, daily temperatures in Sydney can reach 28°C, while at night they dip to 17°C. Wrap up your sightseeing on the 30th (Wed) to allow time to travel back home.